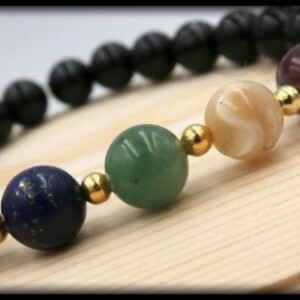 Attract understanding and calm your emotions with Green Aventurine, Black Tourmaline, and Red Jasper. The "Stone of Prosperity", Green Aventurine, helps with indecisiveness, brings understanding, stabilizes one's state of mind, calms anger, and brings together intellect and emotions. Black Tourmaline grounds spiritual energy, clears and balances all of the chakras, creates a protective shield, disperses negative energy, and aids in problem-solving. Red Jasper helps to bring problems to the light, make excellent worry beads, calms emotions, cleans and stabilizes the aura. 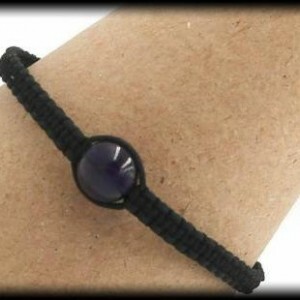 This bracelet is crafted with 8mm beads of Red Jasper, Black Tourmaline, and Green Aventurine. SIZING INFORMATION Please measure your wrist with a measuring tape to ensure the most accurate measurement. If you do not have a measuring tape, you can also use a string by wrapping it around your wrist and then cutting the piece of string. After you have your cut string, place it alongside a ruler and write down your measurement. To ensure a perfect fit, please had 0.5 inch to your wrist measurement, if you want a little room please add .75 inches to your wrist measurement.